in London and the UK for the month of May! Check out our Book TRAILER! 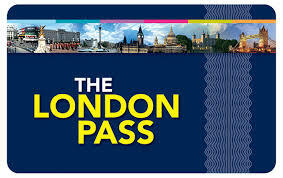 And, win amazing London themed prizes! 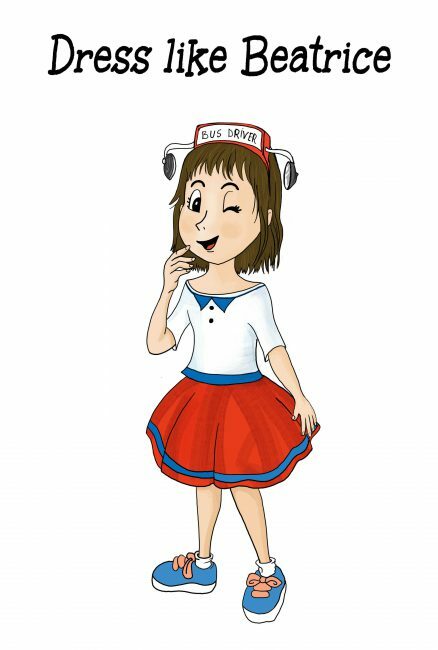 9-year-old Beatrice has a dream, she wants to be a Bus driver and drive a talking London Bus across London. 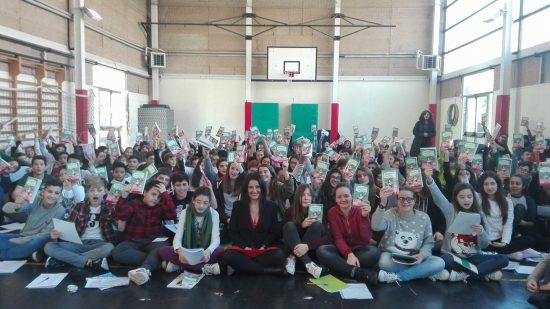 As her dream come true, she will come to discover a city full of secrets and secrets inhabitants; talking buildings and tourist attractions who all have their own souls, dreams and problems. Yes, lots of problems and they complaint about all day long with the Mayor of London who has a couple of terrible secrets of his own, while the Queen of England …. HOW TO DRESS LIKE BEATRICE! Wear a red length skirt and wear a white top. You can add a blue strip on the skirt and the top bottom of your t-shirt and on your neck, if you want but it is not obligatory. Wear some blue trainers with pink laces. How to make the Bus Driver band: get a standard hairband, then get a cardboard and cut our a rectangular pice, write on it BUS DRIVER and colour it as you like it. Then Cut out the shape of two little rear mirrors, colour them as per the image on your left and stick them with glue on the corner of your hair band. Same with the Rectangular Bus driver, stick it on top of it. And now Take a picture! 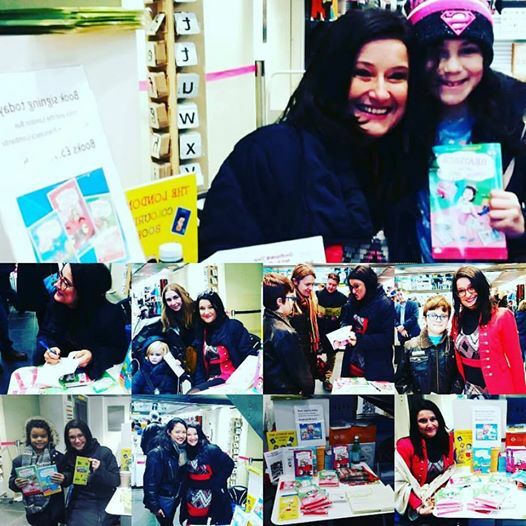 If you have the book, or you can buy in your nearest Waterstones Bookstore, take a picture as you hold the first volume of Beatrice and the London Bus and send it over to competitions@daiyfairytales.co.uk by the 10th of March 2017. 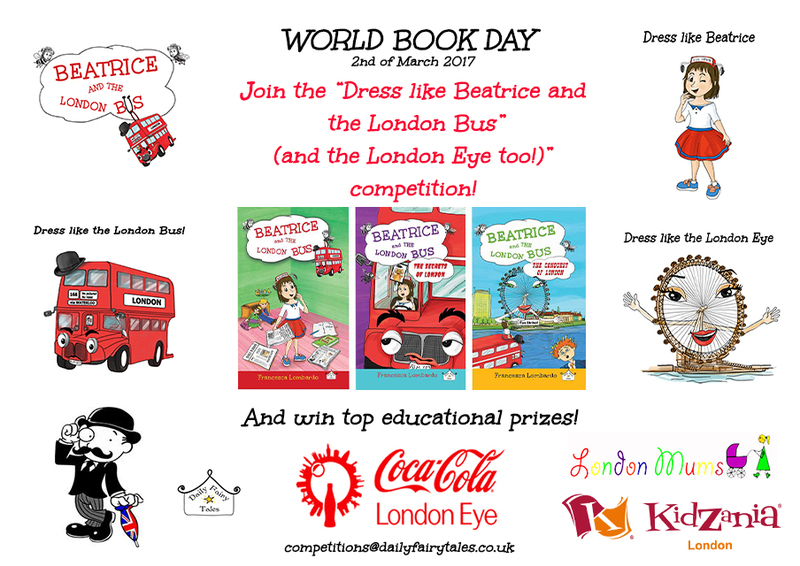 Don’t forget to wear your Beatrice costume at school on the World Book Day and invite your friends to join the comp and dress like the characters too! You will increase your chance to win the a ticket for 30 kids on the London Eye and a ticket for 30 on a Bus tour! LONDON BUS RM 168 Via Waterloo, is an (Imaginary? ), is the last Routemaster Bus left in London and in the World who is only friends with the brave and the Bold! He is a talking London Bus only special people con great imagination can see and hear talking. He is grumpy and always a bit feed up about something, mostly about all the complaints he need to hear all day long from the city’s secrets inhabitants: talking London buildings and tourist attractions who always seem to confide in him for the solution of their problems. He is very afraid of the Mayor of London who wants to get rid of him as he thinks is way too old, till one day he finds a way to survive the attempts of the Mayor to get rid of him and send him to the scrapheap. He becomes Beatrice’s trusted friend and together they embark on the most adventurous journey that has ever been written before about London! After all the already best ones that have been written by other authors, of course! The Author says! Something important! 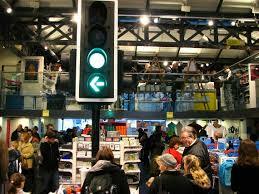 We forgot to mention that his home is the super Wonderful London Transport Museum in Covent Garden! 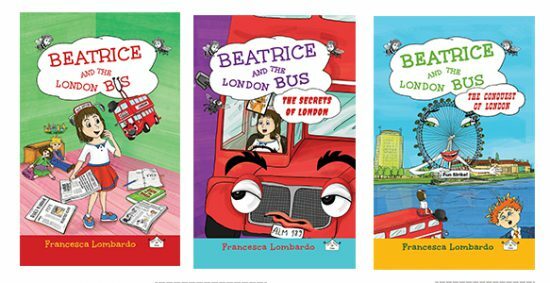 There you can find the three volumes of Beatrice and the London Bus books! And don’t forget to visit the museum inside and ask them if they have seen RM 168 via Waterloo! They’ll probably say that they never heard of him but don’t worry, it is just because it is a secret that the LTM it’s his home! So they will pretend they never heard of him! 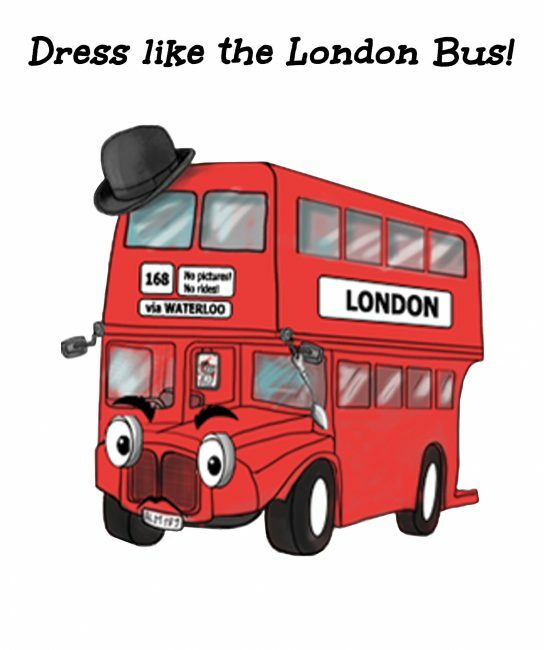 HOW TO DRESS LIKE THE LONDON BUS! Here is a suggestion! Get a white sheet of cardboard big enough to cover you half of your body back and front, length at least, when you fold it. Fold it in two parts and draw the London Bus face at the front and its backside part. Draw any face of your liking. It is your London Bus! Make the best London Bus in town, but don’t forget to write RM 168 via Waterloo on the top, not Pictures! No Rides! and to draw his Bowler hat and his hanging spoon which he uses to eat Tiramisu!! You can also draw the wheels or part of the wheels and the steering wheel. So check the image on your left for inspiration. Once you’ve finished to draw it, colour it, the back and the front. Then cut a half moon right at the top of the folded cardboard so that you can create a hole to wear it as if it was a jumper! And don’t forget to take a pictures and send it to competitions@dailyfairaytales.co.uk PS: don’t hesitate to make your costume in other ways if you got new ideas! Just dare! Have fun and ear it! Well, what can we say about her? You can read everything about her in Volume n. 3 of Beatrice and the London Bus, The Conquest of London. OK, she is mighty, beautiful and HUGE! We know that. She is the most beautiful female attraction in town and everyone in Beatrice’s London seem to have a bit of a crush on her, you know… all those other guys nearby …. Westminster Palace, Big Ben, the MI6, even Buckingham Palace – and she knows it! But the one who has the biggest crash of all the London Bus who is secretly in love with her. She has a problem…though and with the Mayor of London and she went on a fun-strike. Will Beatrice and the London Bus manage to help her and solve her problem? Check out volume 3 – Beatrice and the London Bus – The Conquest of London! 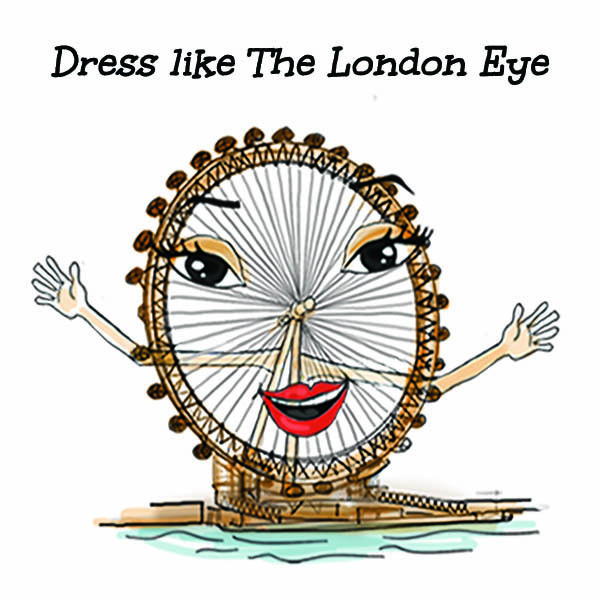 HOW TO DRESS LIKE THE LONDON EYE! Get a white sheet of cardboard big enough to cover you half of your body back and front, knees-length at least as you fold it. Fold it in two parts and draw the face of the London Eye, don’t forget to draw her lovely cabins or capsules and. Draw the front and the backside Part. For inspiration on how to draw it check out the image on your left. And then colour it as you like! 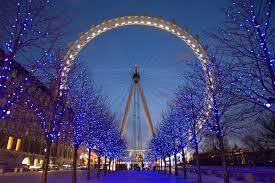 Make the most wonderful London Eye costume in London, in the entire world and in the entire planet. Then cut a half moon right at the top of the folded cardboard so that you can create a whole to wear it as if you were wearing a jumper! Don’t forget to get pictures of yourself wearing the costume, by yourself or with your friends and to send it to competitions@dailyfairytales.co.uk PS: feel free to create your costumes in other way, with fabric if you like, but don’t forget to make her beautiful eyes, mouth and her lovely cabins/capsules! Or, and her hands too!! Have fun!!! 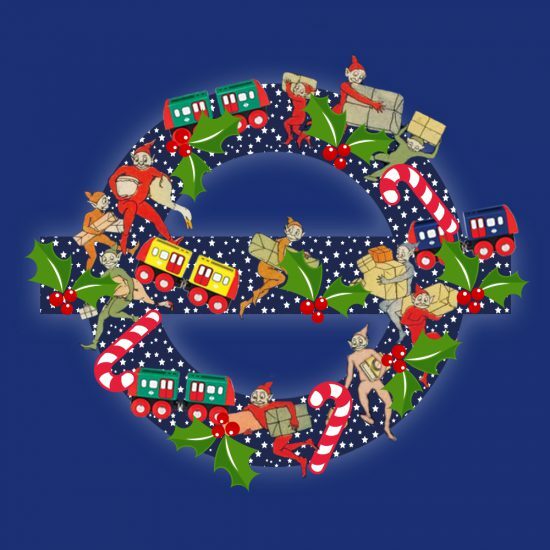 Beatrice and the London Bus Christmas Card! & The Classic Tour free tickets! 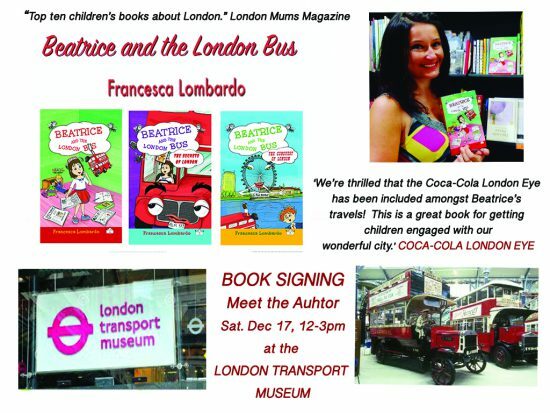 Meet Francesca Lombardo, the author of the newly launched children’s book series Beatrice and the London Bus on a one-to-one 5-10 minutes session with her: she will talk about how to use imagination to write stories, about what inspired the creation of the book series and the fictional characters and of course, about Beatrice’s dreams and adventures about town with her bus friend. 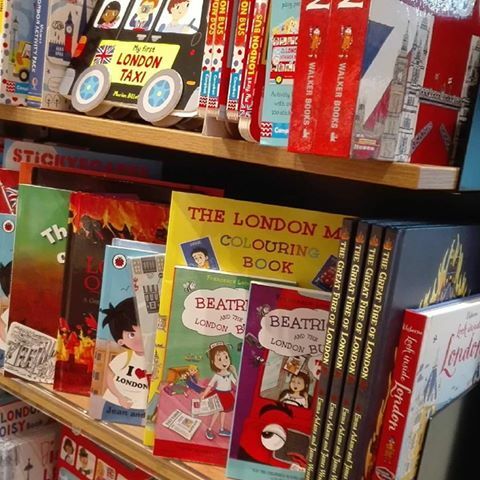 You will also have a chance to take part to the day competition and win a spin off Beatrice and the London Bus’ London Map or the book series spin off colouring book: The London Map Colouring Book! Wrap up this exciting experience with a visit to the London Transport Museum! Free entry for KIDS. TRAVELLING ON A LONDON BUS, WILL NEVER BE THE SAME! Nine-year-old Beatrice has a dream: she wants to become a bus driver but also turn a model of a Routemaster Bus into a real talking London Bus only special people can hear. Together, they’ ll travel around the city, discover its most hidden secrets and meet its very mysterious inhabitants. What if you could turn a Routemaster model bus into a real talking London Bus and become best pals? Drive the talking Routemaster Bus and together discover London’s most hidden secrets, find out everything about the city’s most intriguing tricks and traps, and meet all its mysterious inhabitants? Merlin London AttractionS 1 in 4! had to say about Beatrice and the London Bus. As we just wrapped up our first Beatrice and the London Bus drawing competition, with four wonderful prizes won by 3 London Schools – Crampton School is the lucky school that got to go on the London Eye Flight and you can see amazing pictures on the day on their website – we strongly encourage you, of course, to take a flight on the wonderful London Eye, who is not just a character in the Beatrice and the London Bus Bus also, of course, a fantastic tourist attraction of London, owned by one of the biggest entertainment companies in the UK. Merlin Group! Get a copy of Beatrice and the London Bus on Amazon!